Suunto Kailash has two weather indicators: weather trend and storm alarm. 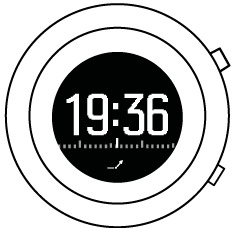 The weather trend indicator is displayed as a view in the time display, providing you a quick way to check weather changes. A significant drop in barometric pressure typically means a storm is coming and you should take cover. When the storm alarm is active. Suunto Kailash sounds an alarm and flashes a storm symbol when the pressure drops 4 hPa (0.12 inHg) or more during a 3-hour period. When a storm alarm sounds, pressing any button ends the alarm. If no button is pressed, the alarm repeats once after five minutes. The storm symbol remains on the display until the weather conditions stabilize (pressure drop slows down).